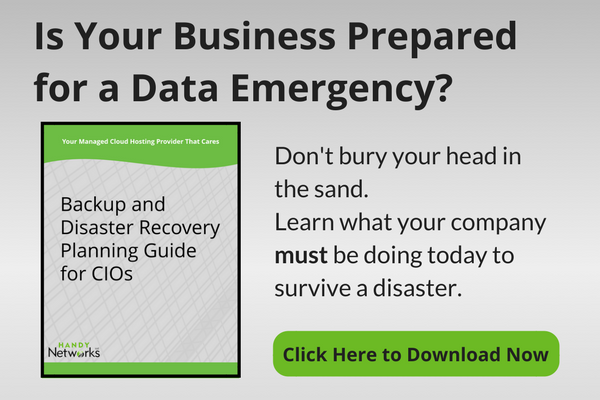 Like insurance and risk management, data backups are one of those business areas that most people pay very little attention to until it’s too late. However, as your company’s CIO or IT director, you can’t afford to indulge in data backup denial and procrastination. There’s simply too much on the line. But at the same time, you don’t have the luxury of devoting the majority of your time and budget to data backups. Yet, you do need to prioritize a few basics. While there are potentially dozens of data backup options you could consider, Handy Networks has done the hard work for you, vetted the contenders, and has a few shortlist options to share. We use a number of different data protection platforms and products. We’re especially big fans of Veeam and R1Soft CDP. Veeam is interesting because it was designed initially to handle virtualized VMware environments and do backup and recovery just for virtualized VMware environments. Over the years, Veeam has expanded its capabilities. Now Veeam can backup Hyper-V and use agents to do bare-metal backups of bare-metal Windows and Linux servers. Veeam can also be used as part of a disaster recovery strategy. Veeam Cloud Connect replicates your backup onsite (if you are hosted in the cloud) or offsite (if you are hosted on-prem). Veeam can spin up virtual machines instantly (depending on the infrastructure you’re using). So if you need to recover quickly, you can spin up the VM. Veeam supports stateful backups of Active Directory, Exchange Server, SQL Server, and Oracle. Veeam backup/restore is solid, easy to perform, and has a number of options to leverage SAN-based snapshots for backups, further improving backup performance. Ability to use Common Internet File Systems (CIFS) for the storage backend, making it easier to scale storage on a per client basis. As robust of a data backup platform as Veeam is, it isn’t for everyone. Why? Veeam comes with a pretty hefty price tag. The price for Veeam works out to about $12 a month per VM, just from a licensing perspective. If you have 100 VMs, you’re paying $1,200 a month just for the software licenses. For some organizations, there are no issues with these costs. Other clients are much more budget-conscious. Veeam also lacks an intuitive, web-based self-service portal that you or your customers can rely upon to do their own restores. For our clients that require a more affordable price point and self-service portal, we recommend R1Soft CDP. As one of the initial customers of R1Soft CDP’s 2.0 release many years ago, it’s been interesting for Handy Networks to see the product evolve. At this point, we are pleased with R1Soft’s feature set, especially relative to its price point. R1Soft was initially conceptualized as a backup system to be used by data centers and hosting companies. As a result, it has a number of features that facilitate self-service restores for end users, through a web-based interface and control panel integrations. With this feature set, Handy Networks can provide users and customers with logins to the backup systems, so they can monitor and restore their own files when desired. R1Soft CDP is also very inexpensive. Handy Networks has a very aggressive licensing deal with R1Soft that’s much cheaper than Veeam. As a result, R1Soft CDP is usually the default offering that Handy Networks bundles with bare-metal dedicated hosting and entry-level private cloud hosting.